I’ve been living added-sugar free for over 4 years now, and have gotten used to going without dessert. I’d have some berries or maybe some dates on a special occasion, when everyone else was having cake or ice cream. I never dreamed that one day I’d be able to have something resembling a real dessert again, but thanks to my friend Lise, I can. One day when we were walking her dog, she introduced me to something she called “peanut butter balls”. They were delicious! This recipe is very similar to the original hiker’s snack recipe my friend used, but with a couple of key modifications. Each ball has about 173 calories. Fellow sugar addicts may be concerned about the amount of sugar in the dates, but the huge amount of fibre will help even out the glycemic index spike a bit (the sugar in Medjool dates is considered low/medium on the GI scale). There is a bit of protein from the almond butter and the hemp hearts. Don’t kid yourself though, this isn’t health food. Like cheesecake, these little treats have a crack-like combination of sugar and fat, so this is a grey area best navigated with open eyes. But one parent I know was excited about the idea of giving something like this to her kids instead of the usual candy they wanted. “At least it’s made of actual food,” she commented. You can read the nutrition details below. This is a quick and easy recipe. If you don’t have a food processor (or want to get a good arm workout) you can simply combine the ingredients in a bowl and mash them with a sturdy ol’ fork – or your hands. You need to press the dough together before you start rolling, so it will stay together. Add the almond butter to the food processor. Tear the pitted dates into small pieces and distribute them as evenly as possible on top of the almond butter. Add the cocoa powder and the ½ cup of unsweetened coconut. Blend on a low speed. When you think everything is blended, unplug the processor and peek into the mixture. The dates tend to glom together secretly, so make sure there are no date clumps. If you don’t do this you’ll won’t get an even sweetness. Scoop the mixture out into the big mixing bowl. Add the hemp seeds and mix them in. Then add the oats in small batches. If the mixture gets too crumbly and dry, don’t add them all. You can test the consistency by mashing with the back of your spoon – if remains a paste, you’re good. If you’ve gone too far you can add a bit more almond butter. Spoon out about a rounded tablespoon’s worth of the dough and roll into a smooth ball in your hands. Roll the almond butter ball in the extra bowl on coconut. At first the flakes will get sucked into the ball, but as you keep rolling you’ll get a nice even coating of flakes. Set the ball on your plate, and proceed to the next one until you’re all done. Refrigerate right away so they set nicely. 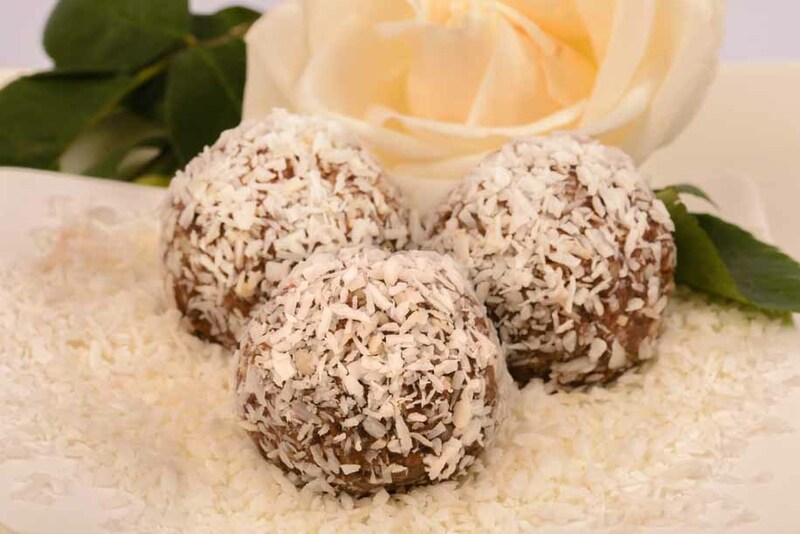 The extra step of rolling in the coconut makes the balls more pleasant to handle while eating, because you’re not getting the dough on your fingers. They also add visual appeal, which is part of the fun of dessert. Here is the rolled and pressed ball. You can see that the surface is moist enough to retain the coconut. If you want to get the full-on peanut butter cookie dough experience, you can use peanut butter instead of almond butter, as recommended in the original recipe. I find that almond butter makes for a slightly more subtle and grown-up version, however. This energy-rich treat keeps well in the fridge for about a week, but will soften and lose its shape when warmed up. The additional coconut flakes on the outside – (included in the tallies above) – only account for 8 calories or so per ball. Cholesterol is negligible in this recipe. Both almond butter and dates are really good sources of calcium, potassium, phosphate, and magnesium. The hemp hearts get you some manganese and iron, as well as a dash of thiamine. Those who are watching their sodium shouldn’t be too worried about the recipe unless you use salted almond butter, or eat the entire batch in one sitting. If you’re doing that, however, you probably have to worry more about the fat than the salt. In terms of vitamins, you’ll get a respectable amount of folate from this treat. Other than that, the vitamin content is not really worth noting, but the dates contain some vitamin A and the almond butter gets you some niacin and a soupçon of riboflavin.